On a different level, Vic Chesnutt’s musical collaborators and co-conspirators, over the past 15 years, are almost as interesting and varied as the southern Gothic bard’s lyrical imagery itself. Always one for experimentation, the artist has collaborated with, among others: Van Dyke Parks, Lambchop, Michael Stipe, Will Johnson, Widespread Panic, and Bill Frisell. I could easily go on. 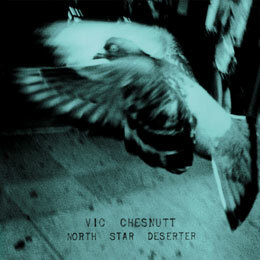 Here, on North Star Deserter, his fourteenth album, Chesnutt once again finds himself surrounded by an interesting and eclectic cast of supporting characters. Recorded in Montreal, and produced by Chesnutt’s fiend, filmmaker Jem Cohen, the players range from Fugazi’s Guy Picciotto, to local Canadian outfit Silver Mt. Zion Memorial Orchestra. Peppered throughout the LP is Chesnutt’s trademark dark wit, which is now as innate to his songwriting as the Southern lore that inhabits his material. Because of this, North Star Deserter (while albeit stylistically different) feels very much like a continuation down the path first tread nearly twenty years ago via Chesnutt’s home recordings. I could not be more happy with this LP. “Wallace Stevens.” What a beautiful song. I’m a huge Vic Chestnutt fan! Love both these tracks. It’s been much too long since I’ve heard anything new from Vic. Glossolalia reminds me a bit of some of Brian Eno’s quieter stuff on Before and After Science…Wallace Stevens is classic Vic, though his voice has an added richness these days…very nice!